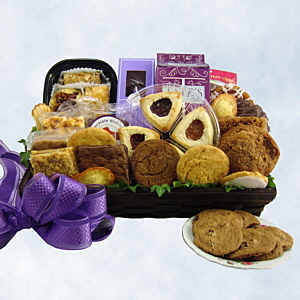 Delectable Baked Goods packed in a woven wood basket. A vast array of treats including: Coffee Cakes, Cookies, Bar Cookies(brownies, apple bars, pecan bars and such), Cinnamon Rolls, Tray of Rugalach, Baklava, the incredible Tate Oatmeal Rasin Cookies and the even more incredible Rustic Bakery Chocolate Coca Nib Bars. We even included a few delicious vegan and gluten free items to keep everyone happy (they really are terrific). Well over 64 individual pieces, with some being large enough to cut in half (or not). Note: If shipping to the East Coast please select 3 day shipping and ship on a Monday or Tuesday, otherwise we will need to substitute something else delicious for some of the more perishable items.